Despite all my recent Adobe Illustrator work I’m still a pencil artist at heart. It’s where I’m the most comfortable and most effective. I’ve always seen drawing like carving. The blank page is a stone, pencil lines cut away the excess until the finished result springs forth. The more work I do recently the more apt that comparison is. There’s still nothing quite like creating a character or a design in your head and watch it come to life on the page. Though it may not be as efficient and may cause lots of graphite-stained hands and eraser dust messes on the table it’s still the most expressive way to create I know. I have lots of designs, from projects that never got off the ground, to one-offs that were never intended to go beyond a single image. I thought I’d share some of these to show that, while computers can do a lot, they still can’t create the same organic artwork that can be made by hand. 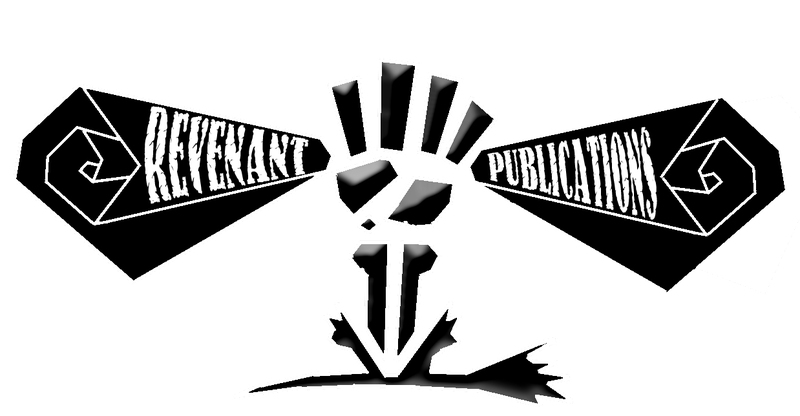 This is the original Revenant Publications logo I designed by hand. I knew this venture would need a brand of some kind and I had the concept early on, the fist punching through the earth, rising from the grave to reclaim creativity! These are the lofty goals of RevPub and made for a simple logo graphic. Photoshop isn’t designed to do logos as well as Illustrator. The final version can be seen in our header! Even for objects best done in software, where clean lines can be created easily, polygons can be made sharp, and objects lined up perfectly, I still start from paper to create something new. It’s been an interesting progression to take designs from the page, through one software, then through another. The last drawing is a bonus. Back in 2009 I was in the midst of a creativity drought and the other half of RevPub was determined to prove that it was something I could easily overcome. 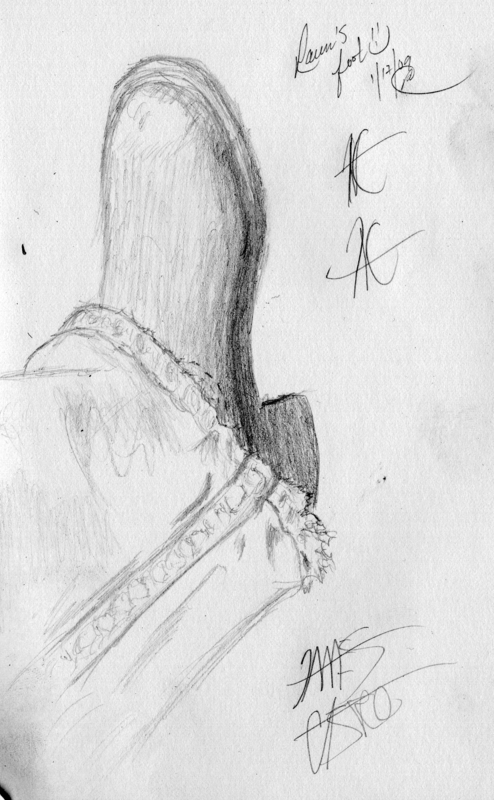 So she told me to draw anything and suggested her boot. So that’s what I drew. It took a little while to completely break down the creative block that stood in the way of actual production, but this began the process. And it represents the first of many recent collaborations, the most important of which is this blog! That’s Raven’s boot alright! She even signed it for me!